In Pembina County, North Dakota, the White Lady of local lore was a young farmer’s daughter destined for sorrow. The story goes that after she bore a child out of wedlock, her fervidly religious parents forced her to marry against her will. The unhappy bride returned home after the wedding ceremony only to find that her baby died in its crib. Apparently, her distress over the baby’s death and the thought of having to spend the rest of her life with a man that she didn’t love were too much for her. Still clad in her wedding gown, the young woman left home and walked to a lonely lane on the outskirts of town, where she hanged herself from a bridge. 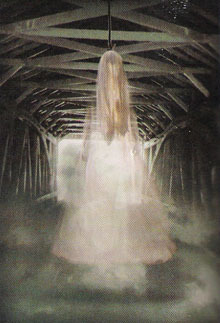 Today, many people claim that if you travel to the bridge at night, you can see the ghost of the grief-stricken girl hanging there in her white dress. The bridge spans a small creek between the towns of Leroy and Walhalla, near the Minnesota and Manitoba borders. It is reached by a narrow, over-grown road, off county Route 9 that leads through the Tetrault Woods. Known locally as White Lady Lane, the gravel road narrows until it’s barely wide enough for a car. The woods surrounding the rickety bridge are dark and eerie. All in all, it’s the kind of place that would scare you even if there weren’t a ghost lying in wait. I am a student at North Dakota State University in Fargo, and a trip up to the bridge has often been the evening activity of choice for my friends and me. While some of them swear they’ve seen the White Lady hanging from the bridge, I’ve yet to see her for myself. Still, I get a strange sensation every time I visit the bridge-and ominous, unsettling feeling that I’ve never experienced anywhere else. It’s as if a melancholy presence were hovering nearby. It seems to be everywhere, yet it’s nowhere to be seen. The sensation goes away as soon as I leave the spot. they’ve had closer encounters. They claim that the spirit of the White Lady has actually climbed into their cars or followed them as they left. They’ve also said that the feeling of being tailed ended as soon as they left White Lady Lane. The old bridge in the woods always scares the daylights out of me, but my friends keep making the long drive north to see it. Someone, or something, keeps drawing us back. Perhaps one day we’ll find out whether it’s the White Lady herself who’s beckoning.